I recently earned $1,000 by doing nothing. It was an excellent experience, and I highly recommend it to anyone who's sick of making money through normal channels, such as work. The opportunity to make $1,000 by doing nothing came about a few weeks ago, when I received a text message from my friend Ronny, who is a) a mechanic, and b) an actor. You don't see too many mechanic/actor combos nowadays, though I must say that the mechanics at my Land Rover dealership do an excellent job of acting like they're surprised to see me whenever I come in for my bi-weekly electrical failure. So Ronny texted me and informed me that there was a big Hollywood movie filming in town, and they were looking for a few cool cars to include in a scene. This didn't surprise me: movie filming is now a fairly normal occurrence in Atlanta, largely on account of the huge incentives local politicians have extended to all the production companies. "We know Canada offers a huge tax break," says the Atlanta film commission, "But we'll give you a huge tax break, and we'll look the other way if you decide to release a live tiger on the streets of downtown." So I mulled over Ronny's offer, and I decided, quite quickly, that it wasn't for me. Oh, sure, it sounded interesting. But I had visions of the car being driven rapidly through the streets, engaged in some sort of wild police chase and/or gun battle, and at the end it's crashed into a huge telephone pole and set on fire in a spectacular, enormous blaze of explosive special effects. And then, once filming wraps up, the production company would take me aside and say: "We're sorry that your car is now an unsightly pile of melted goop. But please accept this free copy of The Change-Up, starring Ryan Reynolds, as compensation." But then Ronny told me two things that quickly made me change my mind about the whole thing. Number one, they wanted to pay me one thousand dollars for just a few hours with the car. And number two: if I didn't comply, they would burn my body in a spectacular, enormous blaze of special effects, and then bury me in a shallow, tax-deductible grave. No, that's not really what he said. The second thing was that they didn't even need to move the car during filming. What would happen, as Ronny explained it, is that they would take the car to the set, park it where they wanted it, and not touch it again. And then, at the end of the filming, I would come collect the car, and also pick up my check for a cool thousand bucks. So a few nights ago, I drove my Ferrari down to the movie's staging area, and I met up with Ronny, who was driving a friend's Lamborghini for the same purpose. Naturally, things went great. We danced. We drank. We laughed. And we hob-nobbed with a series of famous actors, including Tom Hanks, Russell Crowe, Julia Roberts, Marlon Brando, Fred Astaire, Thomas the Tank Engine, and that guy who got eaten by T-Rex in Jurassic Park. This all got very boring, so I left after a little while and had dinner. 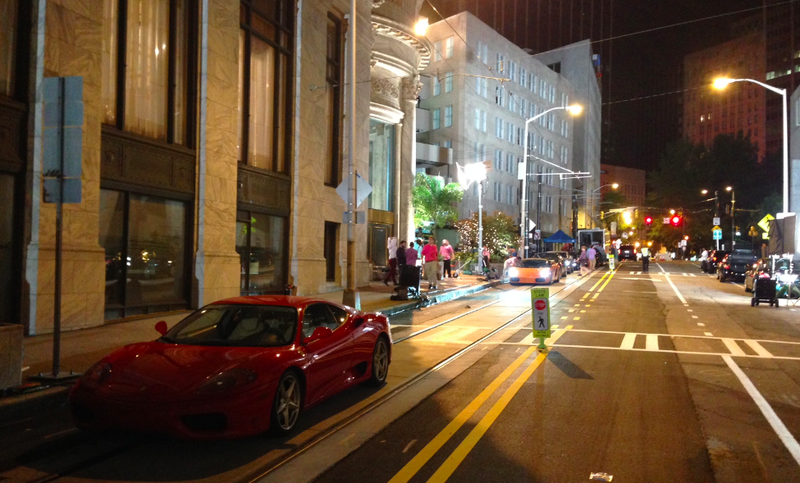 But Ronny tells me the Ferrari played a key role in the filming of the movie. Unfortunately, I cannot tell you what role it played, or even what movie it was in, as a condition of accepting that thousand dollars. But what I will say is that both Marlon Brando and Thomas the Tank Engine agreed it was a particularly awesome car, and the guy who got eaten by T-Rex told me – and this is a direct quote – that the Ferrari is "a lot better than going through the digestive tract of giant lizard from the late Cretaceous." Most importantly, the check cleared.